Indian-American engineer mission specialist astronaut 1994-2003. She perished with the rest of the crew of the shuttle Columbia on 1 February 2003. Status: Deceased; Active 1994-2003. Born: 1961-07-01. Died: 2003-02-01. Spaceflights: 2 . Total time in space: 31.62 days. Birth Place: Indian. Educated Punjab Engineering; U Texas; U Colorado. Born in Karnal, India. Date and month of birth unknown. Dr. Chawla enjoys flying, hiking, back-packing, and reading. She holds Certificated Flight Instructor's license and Commercial Pilot's licenses for single- and multi-engine land airplanes and single-engine seaplanes, instrument rating, and Private Glider. She enjoys flying aerobatics and tail-wheel airplanes. Dr. Chawla was hired by MCAT Institute, San Jose, California, as a Research Scientist to support research in the area of powered lift at NASA Ames Research Center, California, in 1988. She was responsible for simulation and analysis of flow physics pertaining to the operation of powered lift aircraft such as the Harrier in ground effect. She modeled and numerically simulated configurations that include important components of realistic powered lift aircraft, both in hover and landing mode, using Navier-Stokes solvers on Cray YMP. Following completion of this project she supported research in mapping of flow solvers to parallel computers such as the Intel iPSC-860, the Intel Paragon, and the TMC CM-2, and testing of these solvers by carrying out powered lift computations. In 1993 Dr. Chawla joined Overset Methods Inc., Los Altos, California, as Vice President and Research Scientist to form a team with other researchers specializing in simulation of moving multiple body problems. She was responsible for development and implementation of efficient techniques to perform aerodynamic optimization. Results of various projects that Dr. Chawla participated in are documented in technical conference papers and Journals. Selected by NASA in December 1994, Dr. Chawla reported to the Johnson Space Center in March 1995. After completing a year of training and evaluation, she was assigned to work technical issues for the Astronaut Office EVA/Robotics and Computer Branches. Dr. Chawla will serve as a mission specialist on the crew of the fourth U.S. Microgravity Payload flight scheduled for an November 1997 launch on board Columbia on mission STS-87. Family: Astronaut. Country: India, USA. Flights: STS-87, STS-107. Projects: STS. Bibliography: 12, 600, 5254. 1961 July 1 - . 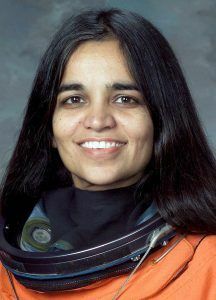 Birth of Dr Kalpana Chawla - . Nation: India, USA. Related Persons: Chawla. Indian-American engineer mission specialist astronaut 1994-2003. She perished with the rest of the crew of the shuttle Columbia on 1 February 2003. 2 spaceflights, 31.6 days in space. Flew to orbit on STS-87 (1997), STS-107..
Death of Kalpana Chawla. - . Related Persons: Chawla. Indian-American engineer mission specialist astronaut 1994-2003. She perished with the rest of the crew of the shuttle Columbia on 1 February 2003. 2 spaceflights, 31.6 days in space. Flew to orbit on STS-87 (1997), STS-107..